The Indigenous Employment coastal team celebrated an important milestone for one of its members today. 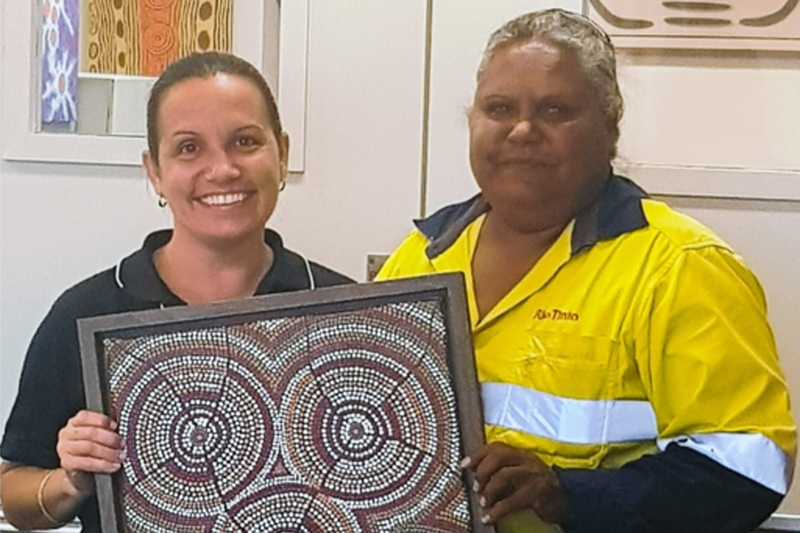 Indigenous Support Officer, Tuesday Lockyer, who is a Kuruma Marthudunera traditional owner, has been recognised for her valuable contribution to the business and the community for the past ten years. Acting Superintendent Indigenous Employment, Jillian Harris, thanked Tuesday for her involvement in the community and advocacy and leadership for Aboriginal culture. 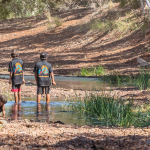 “Tuesday plays a huge part in organising NAIDOC events every year and is spoken about wide and far across the Pilbara,” said Jill. Jill also gave appreciation on behalf of the team for the nurturing side of Tuesday. The team also said goodbye to Natasha Ball, who decided it was time to take on a new career pathway. 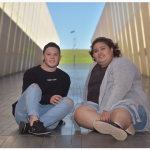 Natasha has worked for Rio Tinto for the past 7-years and has been the Superintendent Indigenous Employment (Coast) for four years of that time. The team held a small morning tea for Natasha this morning and thanked her for her leadership, guidance and support. She was presented with a special painting by Tuesday Lockyer. Natasha said she has enjoyed her time at Rio Tinto. 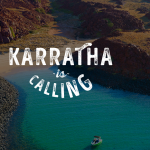 Natasha will commence in her new role at the YMCA as General Manager, Pilbara in two weeks. We wish her all the best in the next chapter of her career.